LAHORE: (Wednesday, September 26, 2018): A delegation of media persons from Italy has called on Punjab University Vice Chancellor Prof Niaz Ahmad in his office here on Wednesday. 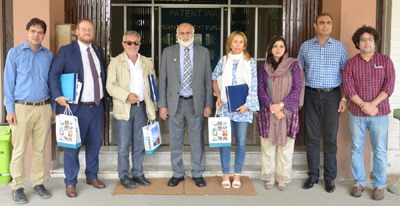 The delegation was consisted of Global Luxury Managing Director Emma Rossi Bernardi, La Repubblica Deputy Editor in Chief Gianluca Di Feo while Institute of Communication Studies’ In-charge Dr Noshina Saleem, assistant professors Shabbir Sarwar, Fahad Mahmood and others were also present on the occasion. Addressing the meeting, the VC stressed the need to enhance academic cooperation between the two countries. In-charge Dr Noshina Saleem briefed the delegation members about ICS radio FM 104.6, PUTV set-up, academic programmes and other facilities. ICS faculty and the delegation discussed various areas of mutual interest. Later the delegation paid a visit to the Old Campus.